I’ve never been one to hold a grudge but there’s always a first time right? I don’t care that it is against an inanimate object. I went from impressing my sweet little boy with my train track-building skills to being walloped by that same boy at a game which I am pretty sure was made up by some maniac determined to make fools of mothers everywhere and leave their children rolling around on the floor in hysterical laughter as they slowly try and connect those tiny, annoying players with a ball that never stops! Then, as if I hadn’t been humiliated enough, we went and added this to the game/play room too. So, I figured if I couldn’t get a tiny dart to do anything except bounce off of it’s target then at least I could make a pretty space for the game to be housed. Actual dartboard cabinets can be fairly expensive, so I thought I might just try and see if I could create one myself. I headed to our local ReStore where I found this old kitchen cupboard. And I transformed it into a DIY Dartboard Cabinet! I added bead board wallpaper to the back. Sprayed the inside door panels with chalkboard paint for keeping score. We all know what my score will always be. Ugh. And the entire thing got a nice coat of creamy off-white paint. Two little wire containers hold the darts, chalk, eraser and extra tips. And since there was enough room to put the shelf back in, I thought it would be the perfect place to put some board games. The “Clue” game was mine as a child and the “Perfection” game was my hubby’s. I refuse to accept the fact that since they are circa 1970’s they are now considered “vintage”! I also added oiled bronze knobs to the cabinet doors. I suppose I’m just going to have to get used to the fact that even play rooms have to start growing up sometime. But, I don’t have to be happy about it! 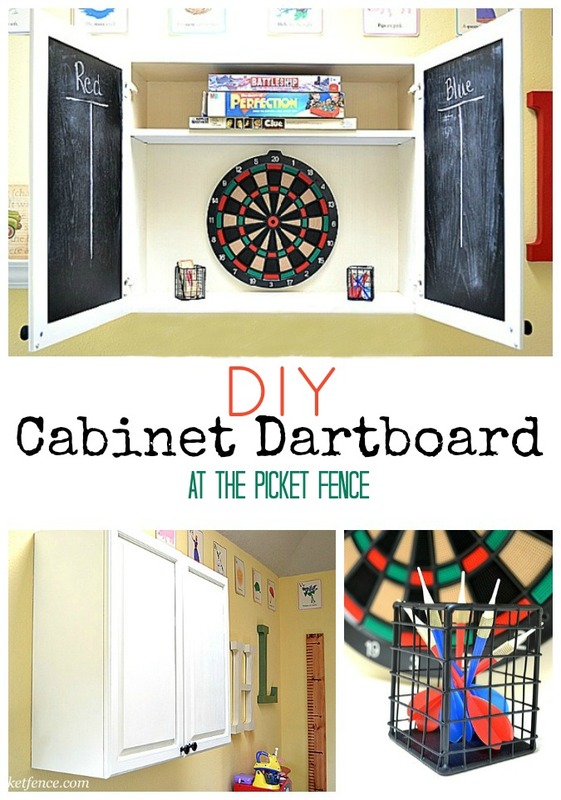 38 Comments on "DIY Kitchen Cupboard turned Dartboard Cabinet"
Neat idea, Vanessa! I love the fact that you can close it up when no one is using it. You’re such a fun mom. If you can’t win at the games, well, at least you’ll decorate the room around them! You are hilarious and so danged clever! WELL DONE – that is true genius, you are a gifted designer for SURE! So creative! I NEVER would have thought of this! I love to play darts and putting the game in a cabinet is so creative. I took a wall in our basement and painted it with chalk paint and added the dart board. Mr. Spring and I like to go play up game every now and then, however I think I need more practice. Great project!! Leave it to you in thinking up such a fabulous piece that not only looks awesome, but is usable as well! Love it! That is so cute and creative. I love what you two come up with. You are incredibly clever. That is such a super idea. I may have to copy this one. Great cabinet!! I looks better than my kitchen cabinets, well for now anyway. They look more like the cabinet before, lol. When you’re really mad at someone, pretend the dartboard is his/her face. My bro put the dartboard on our hatchway door in the basement and drew in chalk all under it the body of the meanest kid in the neighborhood, the actual dartboard being his head. Got pretty good with aim. Watch out for Colonel Mustard – he’s a wiz at darts! Only you could make a dartboard chic! And why oh why do those kids have to grow up?! You are so clever! What a super idea! Cute idea. Yea, be careful with those darts. I use to play them with my dad growing up. What a fabulous idea! I love it. Great job! What a cute idea! I love it. This project would be absolutely perfect in our upstairs “hang-out” room! Vanessa, we’re big game people here. This idea is so perfect, actually for lots of games. We are always needing to keep score of something, and some games get rowdy. Putting the chalkboard on an easel can get tricky and you have to lug it out and store it later. I can see using cabinets as score boards and game boards in general and for things like Pictionary as well as for darts. Good one. I’ll see what I can do with this in our game world! This is a fabulous idea, my boys would love love this. Ready to make another ??? Just kidding. Enjoy your weekend. This past winter I officially got rid of the “toy box” … though, truthfully it became the dumping ground with a 2 inch layer of crayons on the bottom! Very clever idea – looks terrific! Time does fly by way too fast! I was just thinking about my nephew graduating from the same Christian school I went to – I wondered which year he was – my class was the 4th to graduate. I calculated and was shocked to realize 30 years had passed since I graduated! What!? My youngest will turn 19 Sunday – our baby! I don’t feel any different – I just can’t believe it! Cherish the moments while they’re still bouncing around in your home! That is a great idea & turned out very nice. I really do think it’s harder to let our sons grow up than it is our daughters, so good luck to you! What a fabulous idea! Seriously this is so awesome, you amaze me. Love how this turned out, sharing on my FB page! This is genius. It not only works great, but it looks great too. Im stopping over from the network blog hop a little early. I’m a new follower. I’m so gla d I found ou because your Friday link party looks fabulous. It is just wrong to think that our toys are vintage. What a super cool idea! I would so love it if you shared it at Freedom Fridays. Have a marvelous week! You are so smart! This is a great idea andn I love the beadboard wallpaper on the back! You have got to be the coolest mom on your street! Thanks for sharing! Vanessa this is just too cute! If I ever get the boys game room decorated I will have to make one. Thanx for coming to THT! Great idea! It turned out awesome! I feel your pain…when do they grow up?